It’s not a stretch to call Hannah Holliday Stewart‘s (1924-2010) sculptures cosmic. 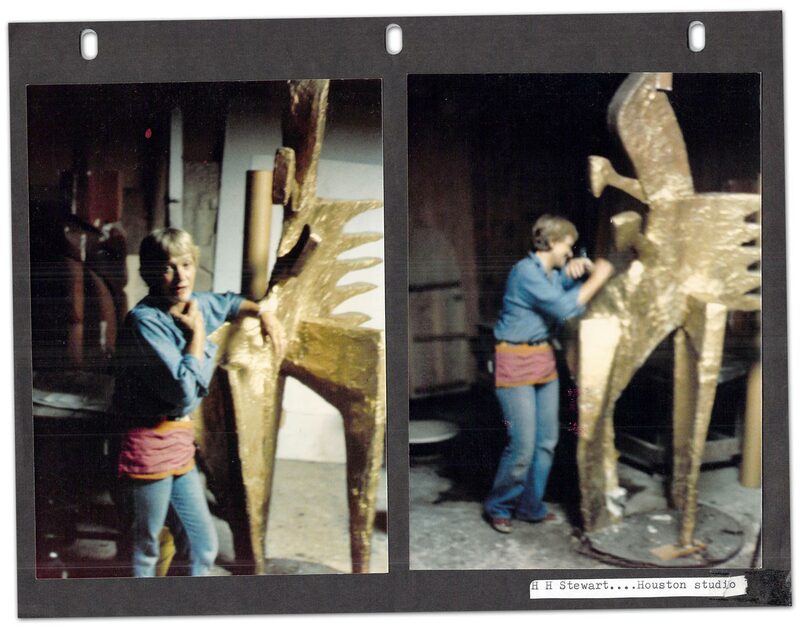 In the artist’s heyday, the bronze forms that emerged from her Houston studio were often over 10 feet tall and thousands of pounds. She aspired to create physical manifestations of complex ideas in science, mythology and other fields, a system of “pure [abstract] symbols as constant as numbers and letters of the alphabet,” as Paul Klee said in one of Stewart’s favorite quotes. The themes she explored were so vast that Stewart’s work was at times cosmically misunderstood. In preparation for our posthumous solo exhibition of Stewart’s work this July, we’ve been digging through the sculptor’s carefully organized personal files. One folder marked “Press” holds a 1994 newspaper article from Stewart’s childhood home of Birmingham. By that time Stewart had lived far away from Alabama for a lifetime, building a reputation in Texas and the Desert Southwest as one of the first female sculptors to win competitive public art commissions. “Ms. Stewart talks of such abstract notions as harmony and energy and spiritual awakening,” puzzled the Birmingham Post-Herald reporter. Throughout the rest of the article Stewart scratched out or rewrote swaths of the writer’s analysis in black ink, clarifying concepts and modifying terms. “[I] always go back to classical order and laws,” she scribbled at the bottom. Stewart was born in 1924 in Marion, Alabama. She studied art in Alabama and Georgia for her BFA, and completed her MFA at Cranbrook Academy of Art in Michigan. After working at foundries in Florida and Mexico, she landed a teaching job at the Museum of Fine Arts in Houston and later at the University of Houston. By the 1960s Stewart’s work had grown to a monumental scale, and a passionate group of Texas art enthusiasts rose to support it. In an era when female sculptors had to fight for recognition, Stewart’s bronze monoliths were popping up all over Houston—and beyond. In 1962 a swooping, Brancusi-esque bird form called “Libertad” appeared in the courtyard of Houston’s World Trade Center, and in 1972 an 11-foot-tall sculpture titled “Atropos Key” landed on a hill in Hermann Park. A commission for a monumental work in Dallas’ Samuels Park spread her name across the state. “I found myself devoted to her work very early, I think,” says Dayton Smith, who befriended Stewart around 1969 when he was working for a Houston photography studio. “I realized the significance of it, the weight of it, shall we say.” Over the next few years Smith helped Stewart in various ways, photographing her artwork, transporting sculptures, and organizing a 1973 solo exhibition at Houston’s Jamison Gallery on Hermann Park. “As I got to know her, I became aware that she was a very literate person, very intelligent,” says Smith. “Her work really did relate to what she encountered in her learning.” Smith noted that Stewart explored many fields of knowledge, from science and architecture to music and mythology, allowing concepts in each field to influence her three-dimensional objects. In 1975 and 1976 she mounted her first major solo show at the Houston Contemporary Arts Museum, exhibiting a series of large plaster models (including “Adam’s Rib“, from the photographs in this blog post) that were based on smaller bronze maquettes. But even as Stewart’s legend grew, Smith says misconceptions about her work persisted. “The word spiritual often comes to mind, but spiritual is such a misunderstood term in our society,” explains Smith. “If you look at the word itself, the Latin root of it is ‘spiritus’. That means ‘wind.’ We can see the wind when it carries things, when it moves things.” Stewart worked to bring the invisible—a musical note, kinetic energy or a wisp of air—into the physical world. More mysterious still to many of Stewart’s friends in Houston was her abrupt disappearance from the art world. Smith last saw Stewart in the late 1980s, when she was teaching at St. Thomas University and exhibiting in an impressive array of art institutions across the country. A few years later Stewart packed up and moved away from Houston, settling in Arizona, Alabama and then Albuquerque, New Mexico. She never exhibited her artwork publicly again. Why would a woman who once showed at the Smithsonian Institution, the Getty Museum and prominent galleries in New York, New Orleans and many other cities suddenly leave it all behind? Smith has a few hunches. Stewart often said that she was inspired by the Desert Southwest, and sent Smith an image of her working in her new studio in Flagstaff. The move to Birmingham probably had to do with the declining health of Stewart’s brother and two sisters, who lived in the area. When it came to her art career, Smith thinks Stewart may have needed room to spread her wings and find new inspiration. Follow our blog in the coming weeks as we unravel the mysteries of Hannah Holliday Stewart’s life and artwork, and make sure to attend the opening of HANNAH HOLLIDAY STEWART: An Artistic Legacy Rediscovered on July 4 from 5-7 pm. Also pick up the July/August issue of American Fine Art Magazine to read more about the show, and follow our investigations on Facebook, Twitter and Instagram. It’s just across town, but the complex that houses our storage unit seems universes away from the cheerful adobe utopia of Canyon Road. We punch in a code and roll through the gate into a desolate world of sharp edges. Seas of asphalt release masses of hot air and long rows of dull aluminum doors form the impenetrable walls of an industrial fortress. As the shadows grow longer the sun’s rays swing sideways and those doors become enormous reflectors. The forbidding barrier transforms into a glowing, many-paneled modernist painting—Gerhard Richter’s Strip series in metal. At this time of day, it’s easy to imagine the units as a series of chests concealing mysterious treasures. What secrets hide behind this shimmering force field? Luckily, we have one of the keys. With one great heave, we send the door to our space skittering up into the ceiling and find ourselves peering into another, much more fanciful, metallic landscape. We’re here to take stock of the life’s work of Hannah Holliday Stewart in preparation for a visit from some interested collectors. Polished, patined bronzes large and small cluster on shelves, tabletops and patches of cement between stacks of cardboard boxes. They’ve accrued a thin layer of dust since we last visited, but it hardly dampens the strange energy that seems to simmer just beneath their surfaces. Stewart’s graceful abstract forms hold all the power that they possessed when we first laid eyes on them last year in Stewart’s studio, where they’d been sitting quietly since her death in 2010. It’s jamais vu: the feeling of encountering something you’ve never seen before. Stewart was born in Marion, Alabama in 1924. She received her graduate degree at Cranbrook Academy of Art, moved to Houston and swiftly embarked on rapid rise that was uncommon for female artists at the time. At the crest of a new wave of social changes, Stewart and other artists such as Ana Mendieta and Carolee Schneemann revived old legends and symbols that identified the woman as a powerful creative force capable of crafting her own destiny. Under Stewart’s paradigm, Nefertiti reclaimed her throne, Icarus had feminine curves and the symbol of the Aquarian Age was a densely muscled female torso. [My] early interest in natural forces has sustained me throughout my life as a sculptor. My goal is to render visible the hidden realities of pent-up contained energy. The direct fields of reference are Sacred Geometry, Astronomy, Myth & Physics … Each Sculpture is an energy form, the movement arrested in space, a form sustaining an energy. My work is a response to these patterns and delineations and communicates with viewers through the universality of symbolism and form. To contain these gargantuan forces, Stewart was often compelled to produce her work at a monumental scale. Photographs in her files show her roaming through a forest of many-legged monoliths in her studio, or manipulating their twisty canopy atop a spindly ladder. 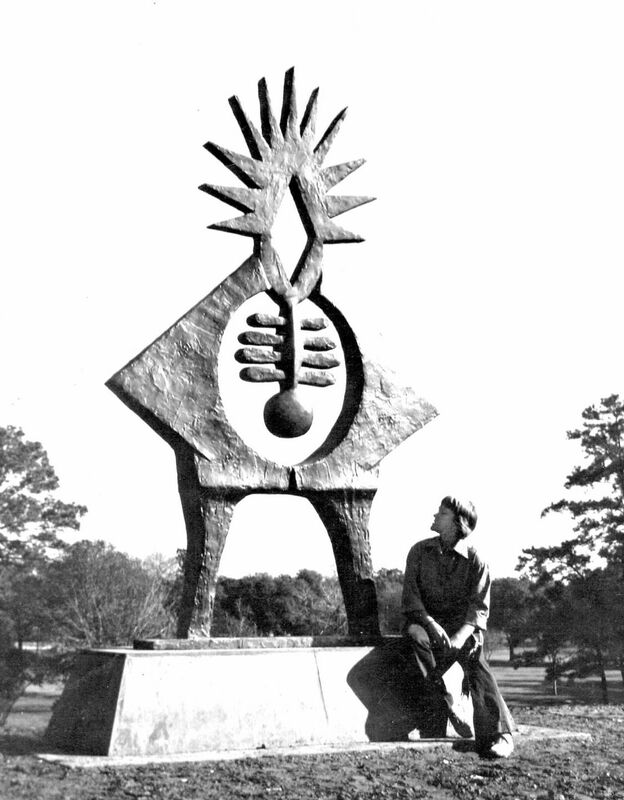 In 1972 she was commissioned to create a monumental sculpture for Houston’s Hermann Park, a rare honor for a female sculptor—especially one who was known for her non-objective work. The spotlight shone bright on Stewart for many years: she exhibited at the Smithsonian, the San Francisco Museum of Art, the High Museum of Art and the Dallas Museum of Fine Arts. Then, 20 years before her death, she abruptly left the Houston art scene without saying goodbye. At a studio in Albuquerque that we would visit after her death, the artist spent the remaining years of her life producing sculptures in solitude. The mystery of her departure from the art world has yet to be cracked. Many of her friends from Houston were still puzzling over it in her obituary. Perhaps there are clues to the more shadowy parts of Stewart’s life hidden in her files, or in the beautiful invented language that she often etched into her sculptures. It’ll take more dusting than we have time for today to unravel the intricacies of her life and work, but one thing is clear: Stewart helped pave the way for a new generation of women sculptors. As we reach for the long rope hanging from the door, we take one last look at Stewart’s peculiar menagerie. A bronze self-portrait peers out from a tangle of supernatural creatures on a tabletop, its eyes blazing in a shaft of sunlight. Then the treasure box slams shut. Click here to see more behind-the-scenes images from the warehouse, and make sure to follow us on Facebook, Twitter and Pinterest for updates on Hannah Holliday Stewart’s work.